February 23, 2011 05:22 ET Miele Law Group PC and Cooley Manion Jones LLP, on behalf of their client Bear Creek Technologies, Inc., filed a lawsuit on February 22, 2011, in the Eastern District of Virginia against twenty-three defendants, including RCN Corporation, Verizon Communications, Vonage, AT&T, Time-Warner Cable, Comcast Corporation, T-Mobile USA, Charter Communications, Cox Communications, Qwest Communications and CenturyLink, alleging infringement of United States Patent Number 7,889,722, titled “System for Interconnecting Standard Telephony Equipment to Internet Protocol Networks.” The complaint seeks both injunctive relief and unspecified damages. The complaint describes the patent, which was filed in 1996, as a visionary paradigm shift from the infrastructure then used by the telecommunications industry. As the Internet rose in prominence in the early to mid 1990s, technologies developed to allow consumers to use computers to place long distance telephone calls over the Internet, rather than the public switched telephone network (“PSTN”) and avoid long-distance charges. As telecommunications companies began to appreciate the economic impact of this development, tensions developed between providers of standard telephone switching technologies and proponents of what was soon to be called Voice over Internet Protocol (“VoIP”) technologies. Rather than viewing VoIP technology as an alternative to standard telephony equipment and infrastructure, Joe Thompson, founder of Bear Creek Technologies, envisioned a paradigm in which VoIP would cooperate with existing standard telephony equipment and with the switching and trunking infrastructure already in place. Joe Thompson applied for a patent in early 1996 to memorialize these novel ideas during a time when telephone companies were spending millions of dollars each year managing and deploying telephone trunking and PSTN infrastructure. The patent is owned by Bear Creek Technologies, which has brought this lawsuit to protect its intellectual property rights. 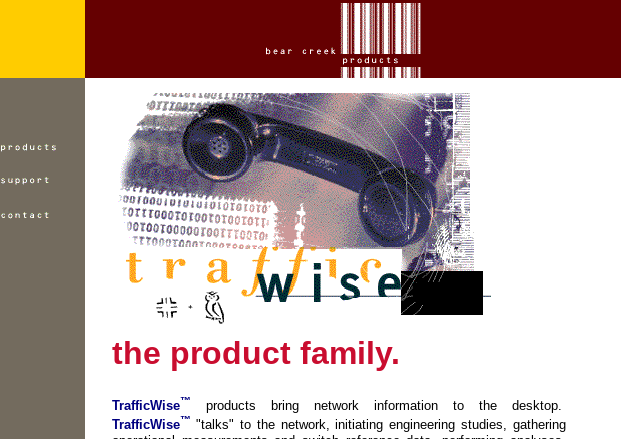 Bear Creek Technologies, which was founded by Joe Thompson in 1995, sells the network management software, TrafficWise™. TrafficWise™ products bring network information to the desktop and “talk” to the network, initiating engineering studies, gathering operational measurements and switch reference data, performing analyses, and producing reports, all automatically. TrafficWise™ applications share an open architecture and a Web browser interface, which support multiple platforms and decrease costs. For more information about Bear Creek Technologies, visit the company’s web site at http://www.bearcreek.com. The patent, “System for Interconnecting Standard Telephony Equipment to Internet Protocol Networks,” is United States Patent Number 7,889,722 and was issued on February 15, 2011.